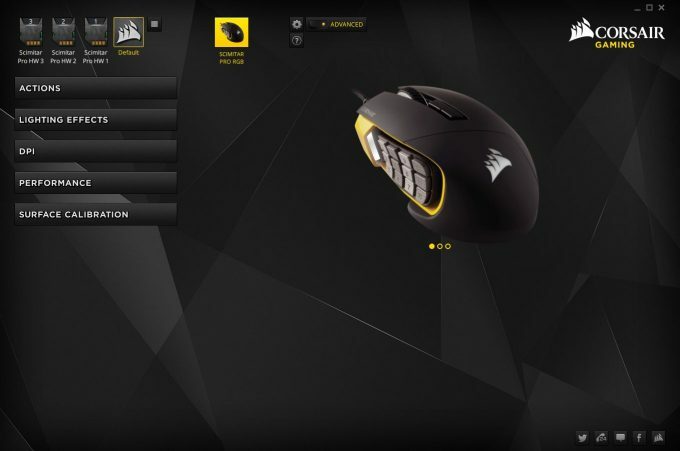 Corsair is no stranger to the world of gaming peripherals, and 2015’s Scimitar RGB mouse is no stranger to MMO and MOBA games. However, the lack of onboard profile storage hurt its flexibility somewhat. 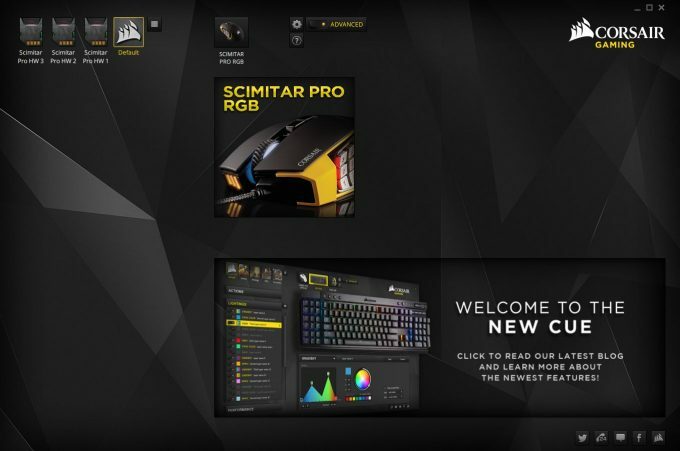 With that corrected, and with a powerful new sensor and updated profile creation software, the newly released Scimitar Pro RGB is poised to stand at the top of the gaming hill. MMOs have been around since the dawn of time, or at least it seems that way. When I fully entered the PC gaming scene after messing about with numerous consoles, the new hotness was this thing called Word of Warcraft. If we fast forward to today, there’s still a slew of MMOs around with more released each year, but there’s a newer contender in the world of online games. The MOBA, or the multiplayer online battle arena game type has exploded in popularity, spawning dedicated leagues and teams of pro players from all over the world. 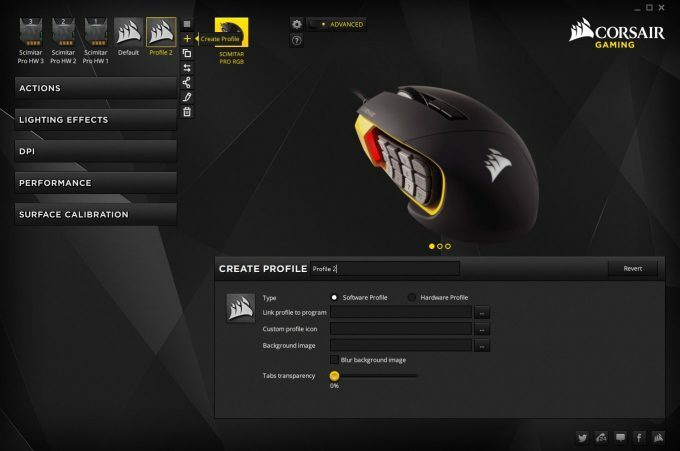 Corsair decided to cater to both the MMO and MOBA crowds with the release of the original Scimitar RGB mouse in 2015. With its adjustable keypad on the side, powerful sensor, and profile creation software, it garnered some high praise on various tech sites, including here at Techgage. 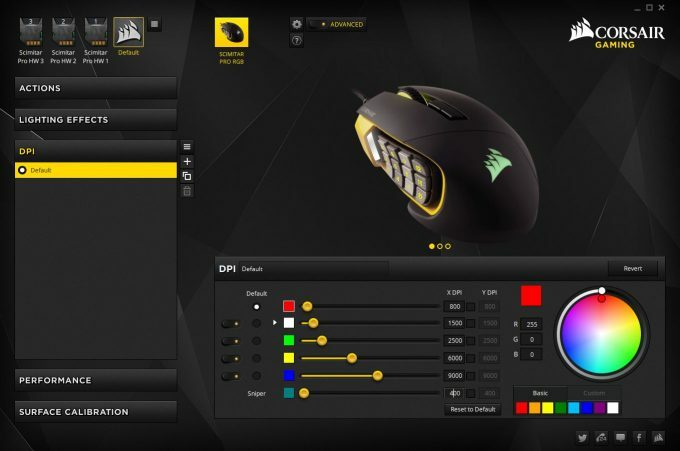 It must have been plenty popular as Corsair has now released an updated version, the Scimitar Pro RGB – featured at CES this year. It features everything that made the original a favorite, but with some improvements to hopefully give MMO and MOBA gamers the edge; correcting one of the major shortcomings that we noted. Without further ado, let’s get down to business by checking out an overall view of the Scimitar Pro RGB. While the black and yellow version returns in this new iteration, it’s still available in all black. 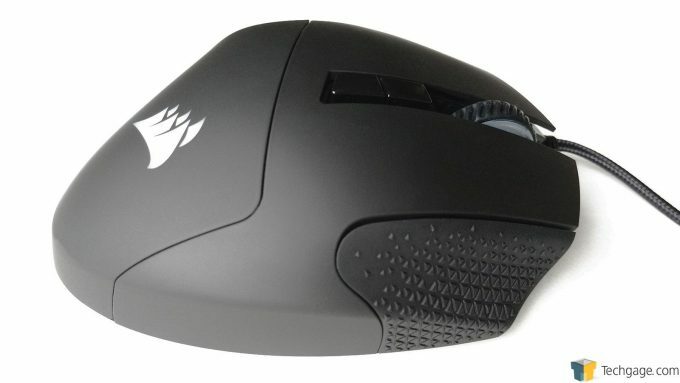 In addition to a beefed up optical sensor, this right-handed mouse now has onboard profile storage, and a surface calibration utility to ensure proper tracking no matter what surface it’s used on. 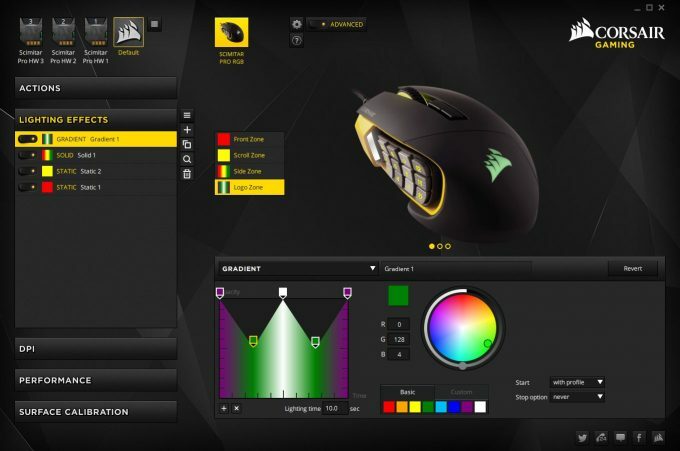 Also as the name suggests, the whole slew of RGB illumination customization options found on the original Scimitar can be found on the Pro model as well. 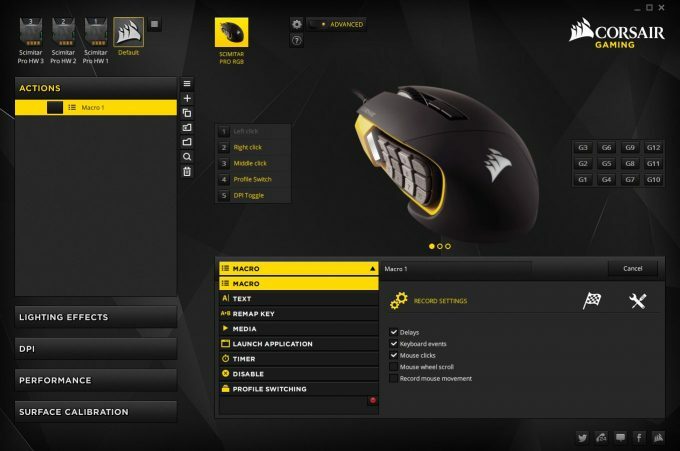 Starting at the front we see the illuminated scroll wheel sitting between the left and right mouse buttons. 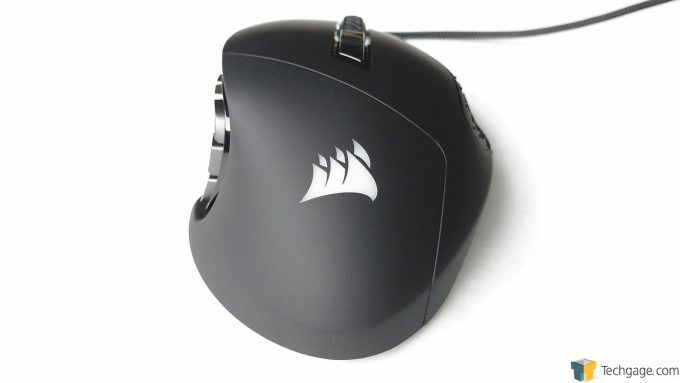 There’s no word on what kind of switches this mouse uses, or how many clicks they’re good for. 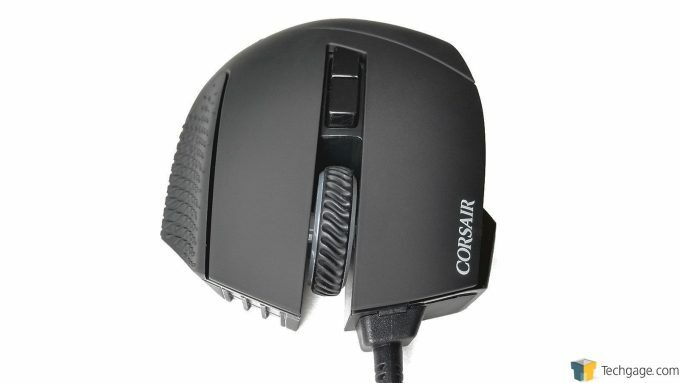 Running from underneath the left mouse button is the braided USB cable, while beneath the right mouse button sits another illuminated area. 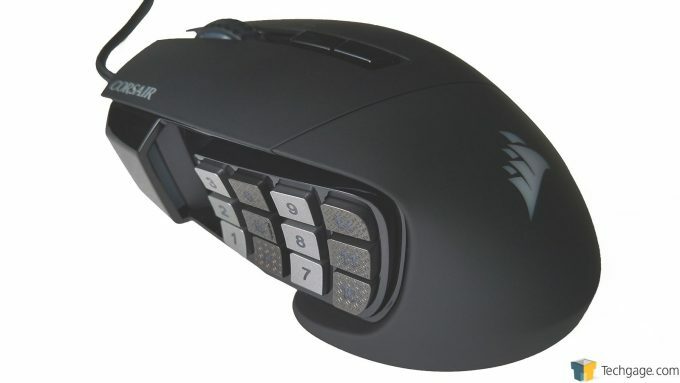 Moving to the left side of the mouse finds one of the bread and butter features of the Scimitar Pro, the adjustable 12-key keypad. This keypad has been carried over from the original Scimitar and features 8mm of travel, allowing it to be moved forward or back to where it’s most comfortable. 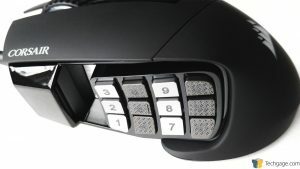 The extra keys are fully programmable, feature differently textured key caps so users know exactly where their thumb is resting, and are illuminated for extra visibility. There’s also an illuminated section directly in front of the keypad that changes based on the DPI setting currently in use. What’s new over the original, is a small lip on the 5 key, to provide a center position to feel for. This was something that was sorely missing, and would often lead to people pushing the wrong key by accident, since there was no reference for whether you were on second or fourth row of keys. 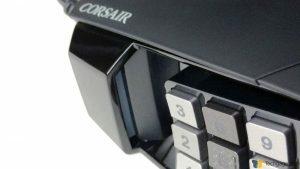 The rear view shows off the general contour of the Scimitar Pro, which Corsair claims is perfect for all users, regardless of hand size or grip style. 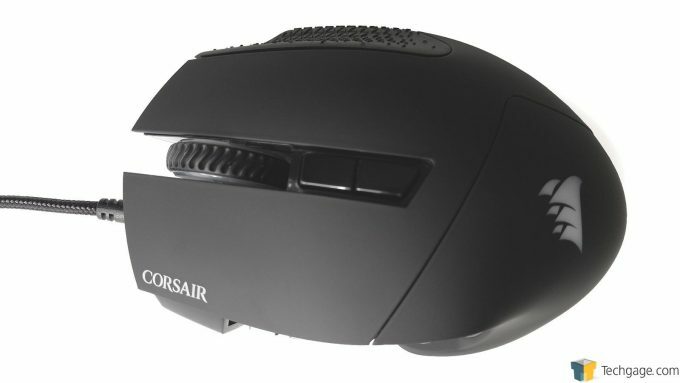 As is the case with many gaming mice these days, the Corsair logo is also illuminated. Over on the right side there’s far less to see, but it’s no less important to the overall comfort of the Scimitar Pro. The curvature of the mouse falls off abruptly on the side, allowing the little finger to rest on the mouse surface, but still grip the lower edge of the textured finger rest for the ring finger. A top down look shows off the overall footprint as well as two buttons that sit just behind the scroll wheel. The forward button switches between onboard profiles, and the rear button switches between DPI settings; both of which we’ll look at shortly. Flipping the mouse over gives us a view of the feet that allow the mouse to glide about. In the middle is an aluminum plate that holds the updated PIXART PMW3367 optical sensor that sports a ridiculously high 16,000 DPI resolution compared to the already out there 12,000 DPI sensor found on the original Scimitar. Next to the sensor is the screw used to unlock and lock the thumb keys in place on the left side of the mouse, using the included Allen key. 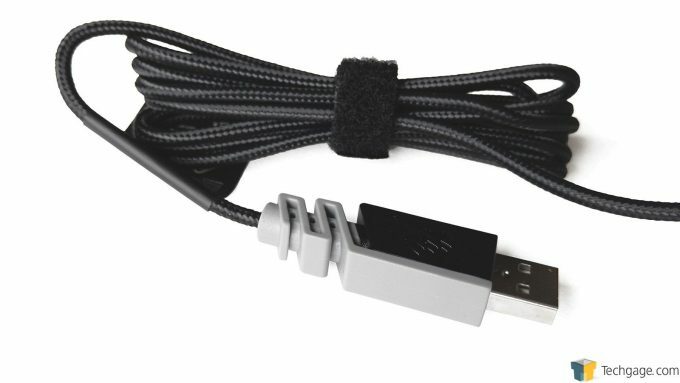 At the end of the 6′ braided cable is a rather substantial USB connection. The Scimitar Pro sports a 1ms USB refresh rate that should make for lag-free input. 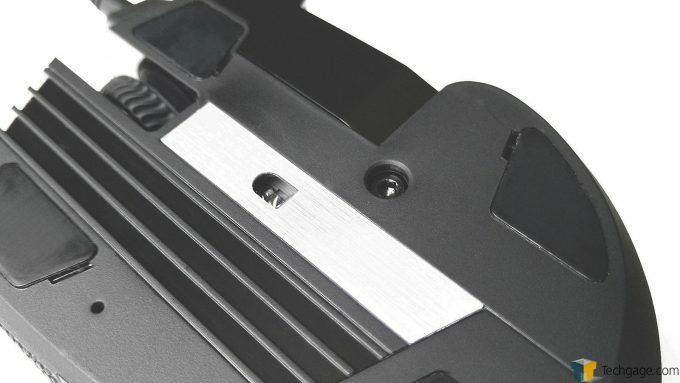 Included with the Scimitar Pro is a warranty guide, the product manual, and the Allen key used to adjust the position of the keypad. A major problem with the original Scimitar was that there was no onboard storage for the custom profiles, and while this has now been corrected, the Corsair Utility Engine (CUE) software is still required to created and edit profiles. After downloading and installing the CUE software, users land on the main page, that shows any connected devices as well as showcases popular and upcoming products. This can be cleaned up by going into the global settings via the gear icon and checking the box to show only connected devices. Clicking on the icon for the Scimitar Pro prompted us to download a firmware update, which left the UI looking like this. The icons in the top left are the four pre-defined profiles that consist of common commands for MMOs and MOBAs, as well as common commands for general PC usage. 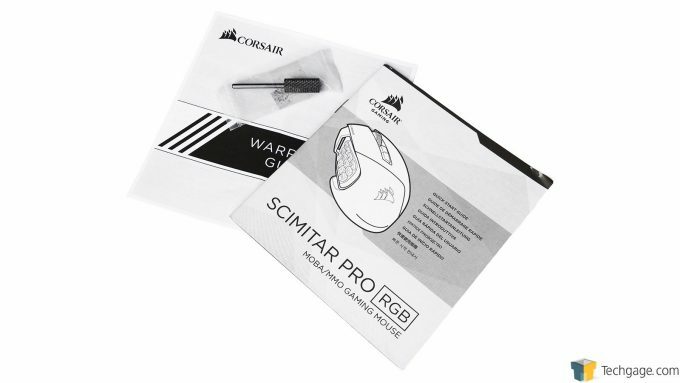 The one with the Corsair logo is already saved to the Scimitar Pro’s onboard memory as a hardware profile, while the others have been saved as a software profile and reside within the CUE software, ready to pushed out to the Scimitar Pro if needed. Clicking the plus sign from the row of icons to the right of the pre-defined profiles will bring up the screen below. Here, a new profile can be named and saved to either the CUE software or to the Scimitar Pro’s memory. These profiles can also be linked to a specific application so it will switch automatically when that application is loaded, setup with a custom icon, and dressed up with a custom background. There’s also the option to blur the background and to change the opacity of the menu windows. Actions can be tied to any key except for the left mouse button, and can consist of anything from mapping a single key press, to inputting a text string, to setting a timer, to creating a macro using the included editor. Once an action has been created, it can be dragged within the list allowing for easy organization and grouping. Macros can be created by either selecting each step one by one, or by recording them on the fly. The recorded macro will consist of any key or button presses, the duration of the press, when the key or button was released, and the time in between the next key or button press. Once the recording has been completed, users can further fine tune every step of the macro to ensure pinpoint precision. As far as lighting effects go, each of the four illuminated areas can be configured separately. Users can choose no illumination, static lighting that does not change, gradient lighting that gradually changes between different colours at a speed set by the user, or solid lighting that does almost the same as the gradient option does, but without any transition between colours. The DPI section allows users to configure up to six different settings per mode that can be cycled through using the DPI selector switch by default. There’s even a Sniper option that can be used for slower, precise movements, and all settings can have the X and Y axis modified independently so movement up and down is different from side to side. Switching between DPI settings changes the colour of the LED that sits in front of the keypad on the left side, and these colours can be edited using the colour picker. 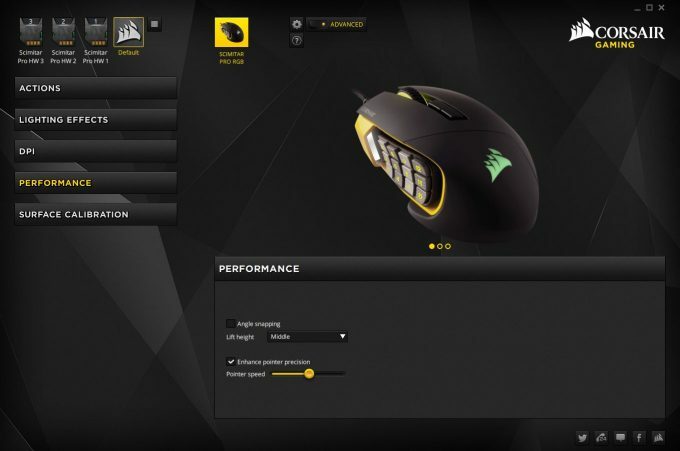 Performance settings are fairly basic, starting with angle-snapping used to predict and correct movement so the mouse moves in more of a straight line than without the feature enabled. There’s also the option to modify the lift height at which the mouse stops tracking movement when raised up. Enhanced pointer precision (aka acceleration) is available, and pointer speed, which acts the same way as changing the pointer speed within windows as a sort of pixel skip resulting in faster or slower movement. 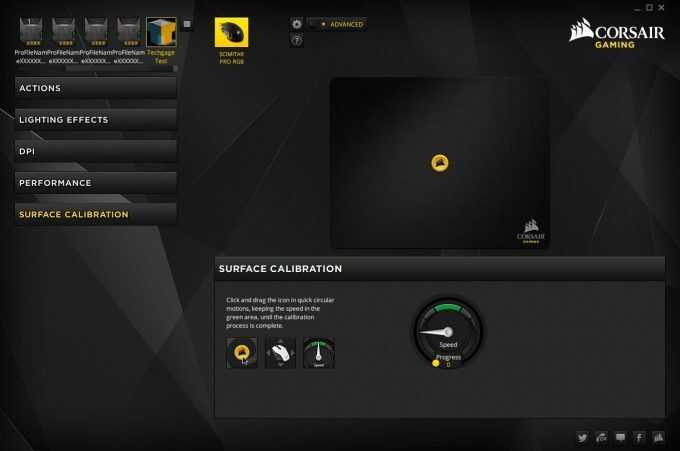 Surface Calibration is the final option, and is supposed to fine tune the Scimitar Pro to ensure proper tracking regardless of the surface being used. Simply click and hold on the yellow circle in the middle and make circles fast enough to keep the needle in the green area for long enough to re-calibrate the mouse.